Reese | One Dog More! Meet Reese, an 8 month old Yorkie-poo. She is the happiest puppy ever. She is up to date on shots, heartworm negative, house and crate trained. She gets along with other dogs, cats and humans. She will either be spayed or require a Spay/Neuter contract to be signed. She is a very playful pup that has been living in a crate the past few months so she needs to have someone teach her some social skills. Reese would make a wonderful addition to any family but would be a great playmate to kids as she is still just a puppy. This is Reese after the groomer today 6-17. Reese was adopted today, June 20, by Olivia G.
This entry was posted in Adopted! 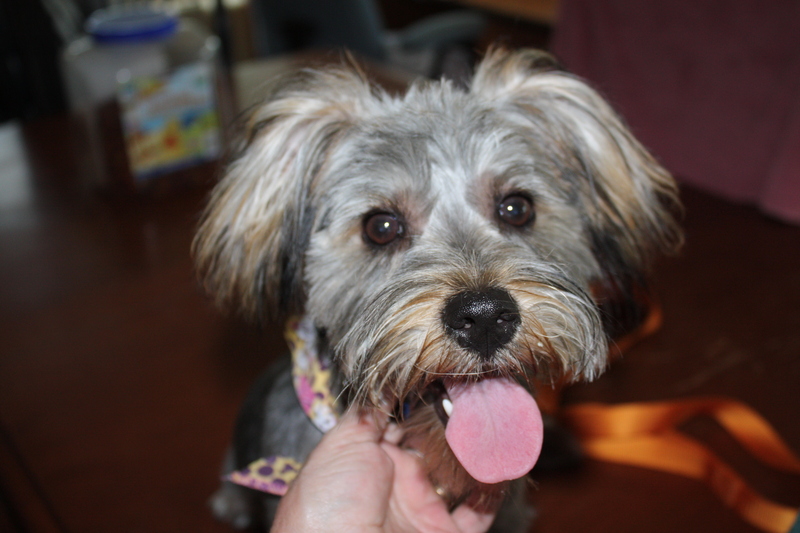 and tagged female, puppy, Yorkie-Poo by onedogmore. Bookmark the permalink. I would like to no how much you are asking for this Yourkie, My mother has my nieces and nephews who are 5 5 5 and10 and they kids really would like to have a dog. If you would please let me no the price of this cutie I would appreciate it. How much are you asking for Reese? We have a home no children.Want a dog to love and spoil.